In these lessons, we will learn demonstrative adjectives and how to distinguish them from demonstrative pronouns. The words this, these, that, those, and what are demonstrative adjectives. We use them to tell our listeners which thing or person we mean. We use this and that before singular nouns and we use these and those before plural nouns. This and these are used to indicate that the items are fairly close at hand, while that and those tend to indicate that the items that are further away. The following table gives the demonstrative adjectives: this, that, these, those. Scroll down the page for examples and explanations. How much is that bag? Would you like these oranges? I am keeping these pencils. I am selling those books. Please give me those clothes. What are demonstrative adjectives and how do we use them? Adjectives gives additional information about nouns or pronouns. Descriptive adjectives tell us something about the quality of a noun or pronoun. Demonstrative adjectives tell us whether an object is near or far from the speaker. There are only 4 demonstrative adjectives. This - refers to a single person, place or thing that is near the speaker. That - refers to a single person, place or thing that is far from the speaker. These - refers to more than one persons, places or things that are near the speaker. Those - refers to more than one persons, places or things that are far from the speaker. Be careful to differentiate between a demonstrative pronoun and demonstrative adjective. A demonstrative pronoun stands alone whereas a demonstrative adjective describes a noun. 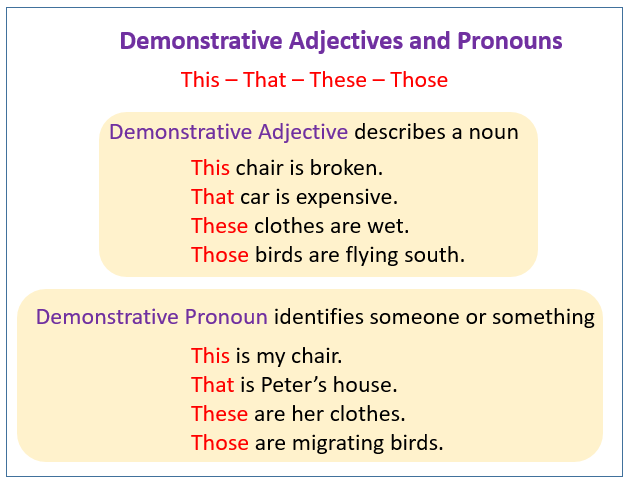 The following table gives some examples to illustrate the difference between Demonstrative Adjectives and Pronouns. How to recognize demonstrative pronouns and avoid adjective confusion?